Chuang Chia-chia (left) pratices in Rio. Three taekwondo athletes are representing Taiwan in their first Olympic Games, competing in a sport that brought the country two gold medals in 2004. 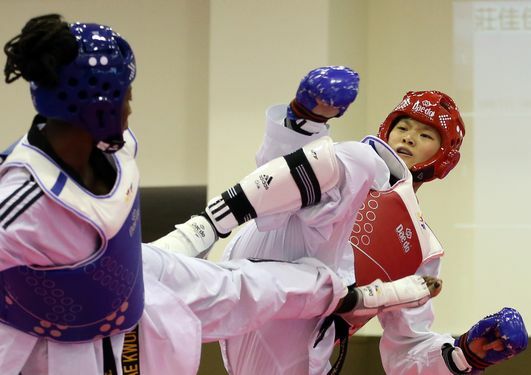 Among the three, Chuang Chia-chia (莊佳佳) is Taiwan's best hope of a medal since she won gold in the women's under-67-kilogram category at both the 2015 WTF World Taekwondo Championships in Russia and the Asian Championships in Manila this year. The 27-year-old said she was moved by the achievement of weightlifter Hsu Shu-ching's (許淑淨), who snatched Taiwan's first gold medal in Rio, and hoped she could follow in Hsu's footsteps. Chuang's teammates are 21-year-old Liu Wei-ting (劉威廷) and 19-year-old Huang Huai-hsuan (黃懷萱). Liu Wei-ting (left) practices in Rio. 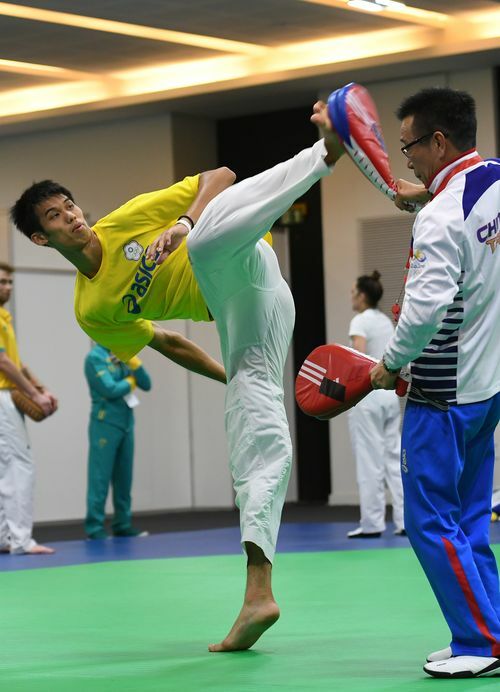 Liu, who won a silver medal in the men's under-80-kg event at the Asian Championship this year, is the first Taiwanese to compete in this weight group in the Summer Olympics. Huang, meanwhile, secured a place on the team in April after another athlete pulled out because of injury. She said she will make the most of the opportunity because it might be her only chance to compete at the Olympic level. She has been on a strict diet to lose weight so that she could compete in the women's under-49-kg category. Huang Huai-hsuan practices in Rio.